WORCESTER, Mass. /Massachusetts Newswire/ — For many animal shelters, the spring means more than just flowers and showers — it means “kitten season.” While more kittens are born in the spring, the number of homeless kittens is also on the rise, says Worcester Animal Rescue League. It can be a trying time for shelters, since so many new animals to care for means a drain on resources. This is why, each year, the Worcester Animal Rescue League hosts a “Kitten Shower” — a supply raiser where the public can help the shelter prepare for the influx of kittens arriving this spring. 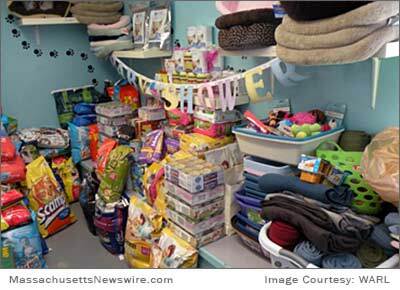 The event will be held on Saturday, April 26, 2014, from 12 – 2 p.m., at the Worcester Animal Rescue League on 139 Holden Street in Worcester. “The annual Kitten Shower is important to us because it means that we won’t have to take resources away from other areas in order to care for the hundreds of kittens that come to our shelter each year,” explains Executive Director of WARL, Allie Tellier. Similar to a baby shower, WARL’s kitten shower is a great opportunity to help the shelter prepare for the upcoming kitten season. At this event, attendees can learn about becoming a foster parent, enter the kitten naming contest, browse the plant and bake sale, and meet the felines waiting for their forever homes. Everyone is encouraged to bring donations of kitten supplies, including adult cat and kitten food (both dry and wet), KMR Milk Supplements, meat-flavored baby food, dish soap, paper towels, bleach, and HE laundry detergent. Don’t be surprised if there aren’t any kittens available at the Kitten Shower. Just as a baby shower provides the supplies needed to care for a newborn, the kitten shower helps us prepare for the little bundles of fluff that will arrive in the coming weeks! The mission of the Worcester Animal Rescue League is to give compassion to every being that turns to us for help, providing shelter and care for animals as well as respect and resources for people. From Kitten Showers of years past, the supplies raised were enough to cover a majority of the necessities for housing and caring for the kittens, and funds were able to remain in other important areas, such as medications and surgeries. For more information on the Kitten Shower event, please visit the Worcester Animal Rescue League’s website at www.worcesterarl.org. We hope you will join WARL for this special event to benefit abandoned kittens while they await their forever homes. Worcester Animal Rescue League is one of the largest no-kill, limited intake animal shelters in the region. WARL prides itself on not establishing a time limit for healthy and adoptable animals, and the staff and volunteers work constantly with foster homes, rescue groups, and other shelters nationwide to place animals in the best possible circumstance. WARL is located at 139 Holden Street in Worcester, MA. Contact WARL at (508) 853-0030 or visit them online at www.worcesterarl.org or facebook.com/WorcesterAnimalRescueLeague.